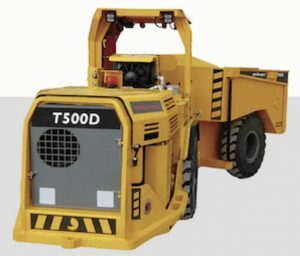 FRANCE – The smallest, articulated mine truck that Aramine makes is the T500D miniDumper, but don’t be fooled. It is a reliable, four-wheel drive haul truck for underground narrow vein applications. Aramine’s T500D miniDumper for narrow vein applications. With four wheel drive, heavy duty articulated frame and oscillating axle, the T500D handles the toughest road conditions. And the short turning radius makes it manoeuvrable in very narrow openings. The T500D with its 2.1 m3 bucket is the perfect complement to the L130D/E miniLoader that can fill the T500D in three scoops. Together they offer a level of mechanization not previously available in narrow vein workings. Based on the same components as the L150D, the T500D aims to increase productivity without the need increase parts inventory. For more information go to www.Aramine.com or click here to watch the T500D in action.